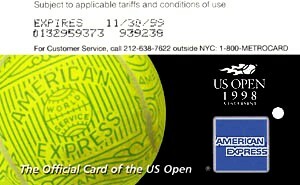 1998 US Open Tennis tournament sponsored by American Express ‘The official card of the US Open’ metrocard is the first of cards features tennis and sponsored by AmEx. Card had circulation of just 40,000. 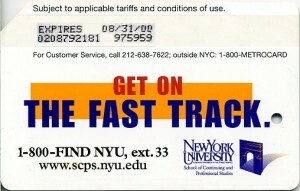 Most likely it was given out to ticket holders at Tennis center in Queens. Matching leaflet has bee issued at the time. 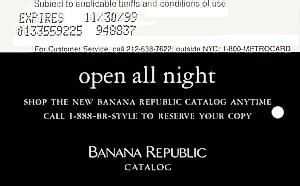 Banana Republic Catalog: Open all night. 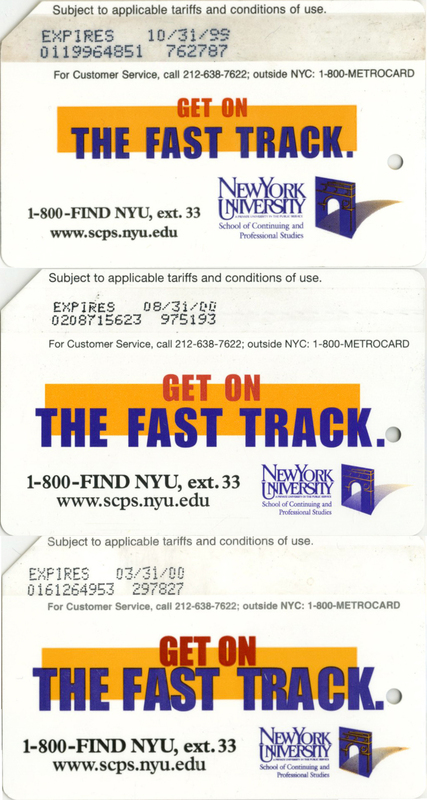 Metrocard had circulation of 100,000 and is the first black and white design. ABC sitcom Dharma and Greg metrocard has the same design as another ABC card ‘Spin City’. It features image of Jenna Elfman and Thomas Gibson. Card had circulation of 500,000. 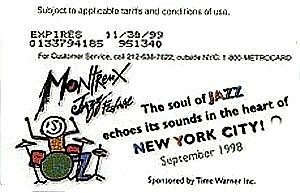 Montrenx Jazz Festival held in New York in September1998 and was sponsored by Time Warner Inc. Card has circulation of 500,000. Starrett City at Spring Creek set contains of 2 cards: English and Spanish versions. 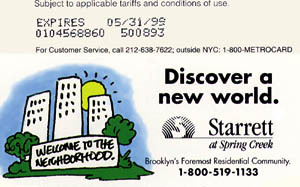 Both cards have the same design and the only difference is slogans ‘Discover a new world’ and ‘Welcome to the neighborhood’ either in English or Spanish. English version has circulation of 40,000 and Spanish of 20,000. 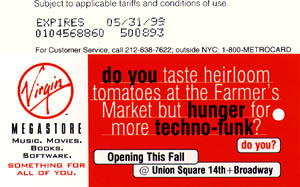 Virgin Megastore at Union Square and Broadway opened its doors in the fall of 1998. Card has circulation of 100,000. 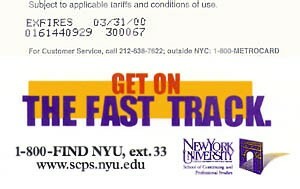 New York University: Get on the fast track metrocard has 3 different versions of font used to display that slogan. Card has circulation of 100,000, however it is not known if that is total for all different versions of font and also there are many different expiration date cards in existence. See here difference side by side. 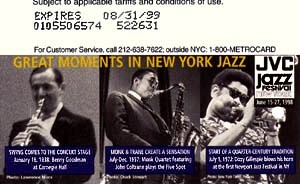 JVC Jazz festival set contains of 2 metrocards, each has circulation of 50,000 and each was distributed separately. Festival was held in New York June 15-27, 1998. This card has 3 images on it featuring Benny Goodman, John Coltrane and Dizzy Gillespie with slogan ‘Great Moments in New York Jazz’. 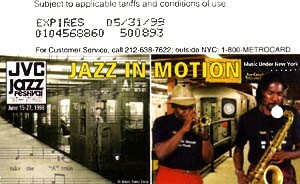 This card features subway station and jazz musicians playing on it. 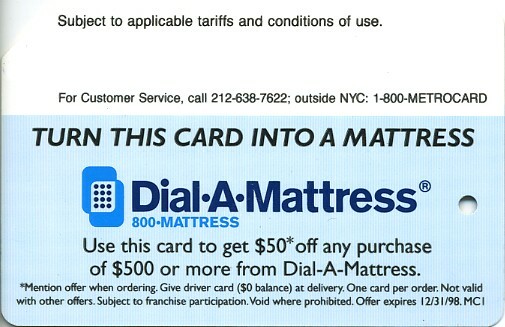 Turn this card into a Mattress is an advertisement card for ‘Dial a mattress 800-mattress’ company issued in 1998 with circulation of 100,000. 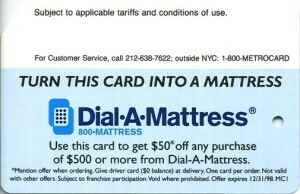 This card could give to user a $50.00 off any purchase of $500.00 or more. 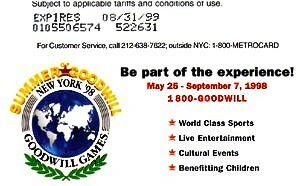 Goodwill Games set contains of 2 cards each was issued separately with circulation of 2,000,000. 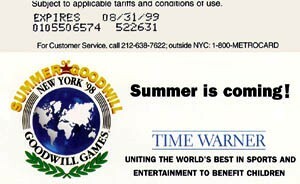 Games were sponsored by Time Warner. 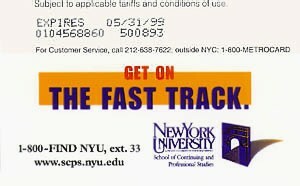 They were held in New York from May 25 till September 7, 1998.